Pyle has finally stormed in to the loudspeakers market with back-to-back release of its Bluetooth PA loudspeaker series. The PKRK215 PA loudspeaker is the latest one to add in the list of high-end, yet low cost party-night music systems. Do you frequently arrange DJ party nights or outdoor movie nights? Then keep reading our Pyle PKRK215 Review, this wireless loudspeaker could reduce your stress, save your time, as well as some dollars. We are going to reveal what you can expect from this budget friendly PA speaker and what is missing out. 2000-Watt ground breaking sound output with 128dB Maximum SPL. 10-Inch dual woofers and dual 3-inch tweeters. 45Hz-20kHz Frequency Response and 3KHz crossover. Bluetooth Wireless Music Streaming from smartphones. 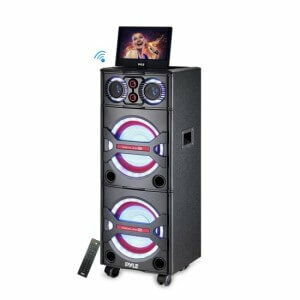 A/V Karaoke Entertainment enabled system that comes with a Wireless Microphone. Built-in FM Radio tuner and CD/DVD Player with Foldout 10-inch LCD Screen. Multi-Colored DJ Flashing LED Lights. Built-in USB and SD Memory Card Readers. The first thing you notice in Pyle PKRK215 as you unpack the box is its stunning looks. The design looks very trendy and perfect match for party nights. The all-rounder device comes with High-powered Active speaker, dual woofers and dual tweeters. It was quite easy to plug-and-play this loud speaker. You can stream music from Bluetooth enabled smartphones and other gadgets, without messing with wires. The system supports uninterrupted wireless connectivity for over 50 feet. The device also has built-in FM radio tuner, DVD player, USB input and SD card slot for added convenience and unlimited music entertainment. Coming to its performance, this budget-friendly PA speaker system does its job up to its expectations. The speaker system produces loud music up to 128dB SPL with incredible fidelity. Though you will not enjoy a surround sound effect, the speaker system is a perfect choice for outdoor fun and part nights. Built-in woofers, tweeters, multiple input options and lightweight design makes this device a best mobile entertainment system. The Pyle PKRK215 specially designed for party nights and outdoor/camping entertainment, which is also the selling point for the company. The PA speaker system comes with Audio & Video Karaoke Entertainment enabled; you will also get a wireless mic in the box. The system also has two ¼” mic inputs to support multi-users. It also has ¼” Guitar/Instrument input. Its DJ party LED lights can be switched-off when not needed, a useful feature when you use the device as normal music system or audio output for TV. Overall, the Pyle PKRK215 wireless PA speaker system is suitable for someone who arrange part nights. The pocket friendly device that comes with built-in DVD receiver and wireless music streaming, could also be used as a standalone music system. Is another sing-along karaoke party is approaching? Get ready to pump up the party with this plug-and-play loudspeaker.